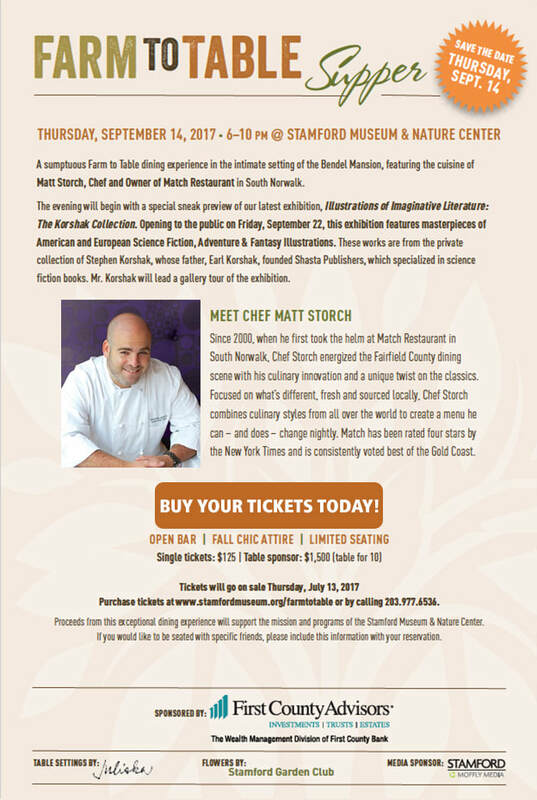 FARM TO TABLE SUPPER | STAMFORD MUSEUM & NATURE CENTER in Stamford, Fairfield County, Connecticut! - FAIRFIELD COUNTY "IT!" ​Join us for the SM&NC's Fall Farm to Table Supper! Matt Storch, Chef and Owner of Match Restaurant in South Norwalk. The evening will begin with a special sneak preview of our latest exhibition, Illustrations of Imaginative Literature: The Korshak Collection. Opening to the public on Friday, September 22, this exhibition features masterpieces of American and European Science Fiction, Adventure & Fantasy Illustrations. These works are from the private collection of Stephen Korshak, whose father, Earl Korshak, founded Shasta Publishers, which specialized in science fiction books. Mr. Korshak will lead a gallery tour of the exhibition. Closed for viewings in Jan. & Feb.
Those arriving on the city bus and holding bus passes or bus transfer tickets are admitted free. Observatory: Members Free. Adults $5, Children $3.